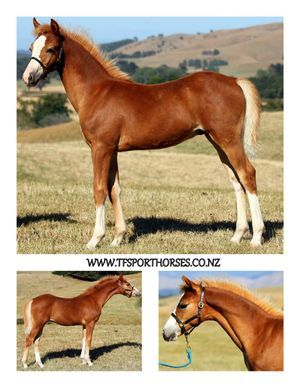 Please contact us if you would be interested in a breeding lease/in utero foal purchase. It's a great way to breed a foal without all of the associated worry and responsibility and in a way that enables you to spread the cost over time. TF Straight Torque - Stand out from the crowd! Foaled at Talisman Farm Sport Horses in November 2018, this head turning boy has all the attributes to be a extremely classy, versatile, fun and competitive fu ture mount for a small adult or an older/taller child. With an EMH of 14.1-15HH (Sire 13.3HH, Dam 15.1HH), Bracken has super performance proven breeding, being by Class 1 Studbook Connemara Stallion ‘Crossiebeg Brennan’ and out of ‘Mischique’ (By Horse of the Year winner, 'Answer Back'/Backchat/Aberlou X Deputy Governor out of Pony of the Year winner, 'Magic'). Step into the paddock with Bracken and you cannot help but be impressed by his strong, correct and uphill movement and his confident/spunky attitude. His striking looks, excellent conformation and flashy movement ensure that he will turn heads wherever he goes. Bracken was bred to jump but demonstrates ‘off the floor’ paces so will also be competitive in showing or dressage. We think he’d also be pretty darned smart in front of a gig and the Connemara as a breed is renowned for its versatility so, why not try it all? 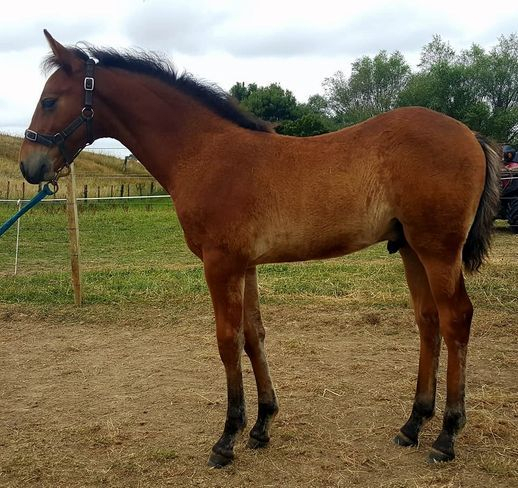 Bracken will be gelded and branded prior to sale and can be registered as a part bred Connemara with the CPSNZ (Connemara Pony Society of NZ). He has been lightly and sensibly handled, and wormed appropriately. He will be available at weaning in May but a deposit will secure. Bracken is insured. $4000, price negotiable, home not. TF Small Torque - EMH 148cm & Bred to be Brilliant! Bramble is out of the beautifully (and classically NZ) bred small hack mare, Mischique (or Mag - pronounced Madge). Mag is a 15.1HH mare by the Aberlou descendant sire 'Sacred Hill Answer Back'. Answer Back was NZ SJ Horse of the Year in 2006 with Claire Wilson and is by the Aberlou son, Backchat. Mag's dam, 'Magic', won the NZ Pony of the Year title in 2004 with Emma Williams, so it will come as no surprise to hear that we purchased this mare with the production of superstar show jumping ponies in mind. Mag's first foal to Crossiebeg Brennan is an exceptional pony type with a bold and confident attitude, strong/straight paces and correct/robust conformation. He has been lightly handled, picks up all feet in the paddock/farrier trimmed and is learning to lead. 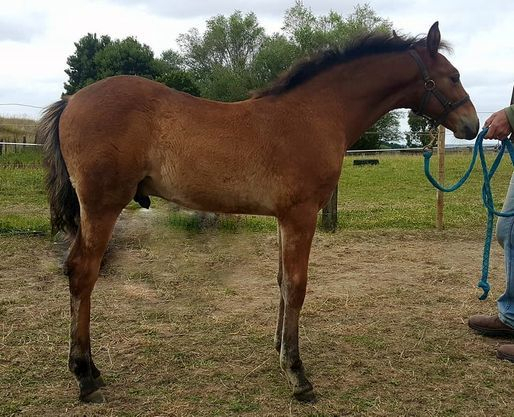 The delightful Showfields Celtic Star is a half sister to Jayne Craike's very successful GP campaigner Showfields Papanui Crusader and is our very first Warmblood broodmare. She is an extremely cute 8 year old, campaigned lightly in dressage to level three and retired to the broodmare paddock through injury. Her sire, Littorio (now deceased) should need little introduction but, in case he does, he was a fully approved and licensed Holsteiner, Oldenburg and Belgian Warmblood. Littorio was the 1995 Grand Champion of the Holsteiner Verband, Neumunster. His sire, Lord is one of the most influential sires in the history of the Holstein and Littorio was one of his last living sons. Littorio has produced National Grand Champion young stock in Europe, also finalists in free jumping and two qualifiers for the Bundeschampionart 2003 and a finalist for the young horse world championships, in Monteray, Mexico. Her dam sire, Ramzes II (imported Dutch WB) was a foundation WB stallion in NZ and sired a great many successful horses, including the grand old dressage campaigner and NZWB sire, Belmont Golden Boy. Lola had a superb filly by TF Hamish in 2017 - TF Sands of Time. 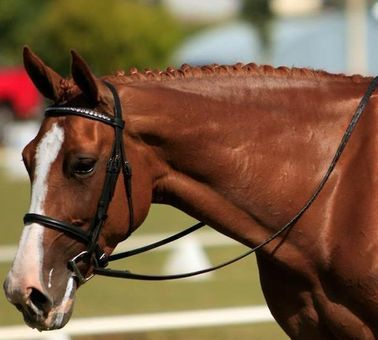 Sansa has now sold to a showing/dressage home. What an opportunity - Full height pony with endless potential! TF Temperance Brennan is a quality performance bred 5YO, 148cm Connemara Sport Pony mare by the talented sire Crossiebeg Brennan (Class 1 Studbook Connemara) and out of Show Hunter/Jumper mare Rei Huia Bernadette (Hifalutin x Laughtons Legend). Tempi has lovely loose, rhythmical movement and a spectacular canter so there's a lot to like if a future in dressage or the hunter ring is your goal. She is a correct, eye catching, versatile pony & a true saddle hunter type (with bone, substance & quality). For sale by her breeder who has spared nothing in her upbringing. Well handled since birth, professionally started as a 4yo, turned away & brought back into work by a professional - She is now being campaigned by a young rider. Her even & generous temperament can make it easy to forget that her age & lack of experience mean that she is still green. Due to this, she will not be sold as a first pony or to an inexperienced rider. Tempi would also make an excellent mount for a smaller lady rider. Tempi is excellent to catch, drench, float/truck, clip, hack & great for the farrier. She has a snaffle mouth, with strong feet & has had her hooves and teeth done regularly her entire life. She is vaccinated for tetanus and strangles. Tempi did sustain an injury to her right eye as a foal and this was treated under close Veterinary supervision and has healed, however has left some residual scarring. We are confident that it is purely cosmetic and has little to no effect on her vision or way of going. We welcome a vet check. Tempi has been hacked out alone & in company, been to arenas/lessons, PC, XC & competitions & is SAFE & always a pleasure. She has come home with ribbons from nearly every outing to date, including at A&P level, most recently winning the Reserve Champion Novice Saddle Hunter Title at Feilding, her 2nd A&P + she has ribbons & a trophy from her 2nd jumping start! Now competing 80/90cm. Tempi has a photo Album HERE on our facebook page and videos now being uploaded to this page also. Sansa or TF Sands of Time (TF Hamish x Showfields Celtic Star by Littorio/Ramses II) is elegant and pretty with a particularly beautiful head and eye, a superb natural topline and a cracking 'engine'. When she moves, she floats along the ground. If you want a pretty small show/dressage horse with a bit of substance, you would be hard pressed to find anything nicer for the price and she's likely to be fairly handy over fences too. EMH 15/15.1HH. Sansa will be branded, hooves trimmed and taught to lead/load on a float or truck prior to sale. Sansa is currently insured with Crombie Lockwood. DOB 05.12.16. I regularly drench my youngstock, vaccinate for tetanus and strangles and they are hard fed alongside their dams with an appropriate broodmare feed. We give them the very best start to life at Talisman Farm. $4k (neg. to the right home). Will consider deposit to hold and time payments - conditions apply, please contact to discuss. Sansa has now sold to a dressage/showing home. Charlie is a striking, correct, upstanding and athletic young TB mare by Volksraad (sire of Nadal KSNZ/Pretorious [Fraser King?s National Title winning International eventer] & Top Shelf [Supreme Champion Show Hack] ) and out of a Casual Lies/Deputy Governor mare. A young mare at only 4 years of age she has many good breeding years ahead of her. I have had Charlie since she was a 2yo and she has thoroughly impressed me with her lovely easy temperament. She is exceptionally good to handle - Easy to catch, worm, trim and very sensible beyond her years and experience. Charlie conceived first cycle, was easy to breed and foaled without assistance. Charlie is approx 163cm. Charlie and Lil are available as a package with the option of a return breeding to Crossiebeg Brennan (or TF Hamish) or individually at weaning. 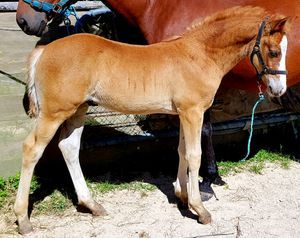 Foal fully insured for $3k. "While we do not plan on breeding ponies inevitably over time we have breed a pony or four. We have in the last few years produced three ponies that have all competed successfully to 3* Pony GP, including Tiger Tale LS who placed 2nd in the Pony of the Year 2013 and 5th in the Pony GP series after missing the first half of the season with rider Emily Fraser an amazing achievement. With another young pony Distinctive Miss LS with rider Caitlin Lally should great scope a combination to watch in the future. Imagine what we can produce when purpose breed. 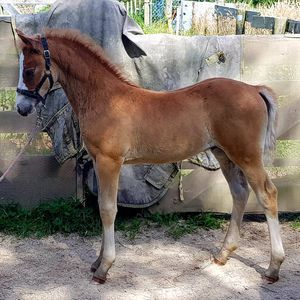 With the arrival of our second daughter May 2016 breeding our own ponies was inevitable, 2015 welcomed our first purpose breed pony a stunning colt Beircheart LS by Connemara Stallion CROSSIEBEG BRENNAN out of Candoo LS a beautiful pony mare that the stud has retain for breeding. Candoo is out of the same mare as Larinium LS who ridden by Georgia Massie has won and consistently placed in Young Rider and Horse Grand Prix Classes in 2016." If you would like me to list your horse for sale on this website, I am happy to do so - please email me with the details and some photos.